Joy & Dee Dee Wike -"Changing our world one bite at a time"
It's the third recipe so I think it's time for some dessert! This cake is the easiest thing to make and is always so satisfying and wonderful. Grab a microwavable mug and let's get going! First add the flour and baking powder to the mug. Give it a quick stir using a fork to mix. Next, add the almond milk, peanut butter, maple syrup, and vanilla. Microwave for on high for 1 minute. 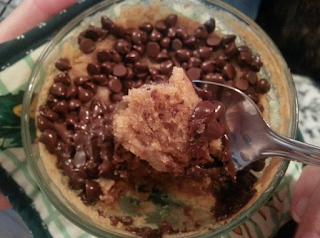 Pull out of the microwave and immediately top with chocolate chips. You're done! The chocolate chips will get nice and melted and you'll be in heaven, even if you aren't a vegan (which you should be). Tag us in a photo if you recreate this recipe! P.S. You can buy Enjoy Life chocolate chips at Kroger, Whole Foods, Martin's, and Fresh Market. Copyright 2016 by Dee Dee Wike. www.feelingveggiegood.com. Awesome Inc. theme. Theme images by kcline. Powered by Blogger.